Most people think of calcium and phosphorus as the most important dietary components for bone health. But magnesium also plays an important role. It is involved in hundreds of biochemical reactions, many of which help keep not only bones strong, but the heart rhythm healthy and the nervous system functioning smoothly. A study by ARS physiologist Henry C. Lukaski and nutritionist Forrest H. Nielsen reveals important findings on the effects of depleted body magnesium levels on energy metabolism. Lukaski is assistant director of ARS's Grand Forks Human Nutrition Research Center, Grand Forks, North Dakota. He and Nielsen, with the center's clinical nutrition support staff, showed that inadequate magnesium is associated with a need for increased oxygen during exercise. They found that during moderate activity, those with low magnesium levels in muscle are likely to use more energy—and therefore to tire more quickly—than those with adequate levels. The study's first phase provided 10 postmenopausal women with a controlled diet adequate in magnesium for 35 days. In the next phase, a low-magnesium diet provided less than half the recommended daily intake for 93 days. The last phase provided a diet adequate in magnesium for 49 days. The volunteers were subjected to exercise tests at the end of each dietary phase, along with biochemical and physiological tests. The data shows that during the low-magnesium-status phase, the volunteers used more oxygen during physical activity, and their heart rates increased by about 10 beats per minute. "When the volunteers were low in magnesium, they needed more energy and more oxygen to do low-level activities than when they were in adequate-magnesium status," says Lukaski. The study was published in the May 2002 issue of the Journal of Nutrition. The body stores about half its magnesium inside the cells of tissues and organs. The other half is combined with calcium and phosphorus inside bones. A tiny amount—just 1 percent—of the body's magnesium circulates within the blood at a constant level. These findings are consistent with other studies showing that too little magnesium makes the body work harder. "The effects are likely to occur in individuals with low magnesium, regardless of whether the person is athletic or sedentary," says Lukaski. "That means that athletes wouldn't be able to work or train as long as they would if they had better magnesium levels. People need to eat adequate magnesium to make sure their hearts and muscles are healthy enough to meet the demands of daily living." The Recommended Dietary Allowance (RDA) for magnesium, based on the current Dietary Reference Intakes (DRIs), for women over age 31 is 320 milligrams (mg) daily and for men over age 31 is 420 mg daily. The DRIs are a set of categories of nutrient requirements by age and/or gender groupings that are released as an authoritative, ongoing series by the National Academy of Sciences. Starting in 1941, RDAs were updated periodically as a separate group to reflect current scientific knowledge. Now, RDAs appear as one of several categories that together make up the more detailed DRIs. ARS provides key data for use by experts who help establish the DRIs. Another study at the Grand Forks center, headed by physician Leslie M. Klevay, with biochemist David B. Milne, found an association between ordinary diets low in magnesium and irregular heartbeats. Klevay heads the center's Trace Elements and Cardiovascular Health Laboratory. The study provided 22 postmenopausal women, aged 47 to 78, with a diet of conventional foods containing either less than half or more than the RDA for magnesium of 320 mg daily. All volunteers ate both controlled diets—each for 81 days—throughout the study, though they were not told which diet was given first. 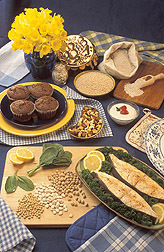 After each 81-day diet phase, magnesium concentrations were measured through blood tests. The scientists also wanted to evaluate the characteristics of electrical impulses that provide pumping instructions to the heart. Electrocardiograms were taken at the end of each phase to measure volunteers' heart rhythms. When the women ate a diet containing just 40 percent of the RDA for magnesium, they showed signs of magnesium depletion in their blood serum, red blood cells, and urine. At the same time, they experienced small increases in heartbeats that arise in abnormal areas within the heart, which are called ectopic heartbeats. They indicate increased myocardial irritability. "These changes indicate that 130 mg of magnesium is too little and that the RDA may be correct," says Klevay. "People who live in soft-water areas, who use diuretics, or who are predisposed to magnesium loss or ectopic beats may require more dietary magnesium than would others." Perhaps not surprisingly, people who live in areas where the water is hard—and therefore contains more minerals, including magnesium—have been found to have a reduced risk for heart disease. Magnesium is sometimes provided intravenously to people shortly after they've had a heart attack, though at least one study showed no evidence of a "survival benefit" from the practice. Klevay's study was published in the March 2002 issue of the American Journal of Clinical Nutrition. Data from the nationwide food consumption survey, the USDA-ARS Continuing Survey of Food Intakes by Individuals (CSFII 1994-96), indicate that only about 24 percent of women between ages 40 and 69 were meeting the 1989 RDA for magnesium. The current RDA-DRI for magnesium is 40 mg higher than the 1989 RDA for that age group. In addition, the ARS Community Nutrition Research Group (CNRG) reports data from its online Community Nutrition Map (CNMap) indicating that only about 32 percent of the U.S. population met the RDA-DRI for magnesium. The CNRG is one of six laboratories in the Beltsville (Maryland) Human Nutrition Research Center. The mapping project combines a collection of food-and-nutrition-consumption indicators (obtained from several sources, including CSFII 1994-96) with Geographic Information System software. This data provides a snapshot of the percentage of people meeting the requirements for different nutrients. CNMap can be accessed at www.barc.usda.gov/bhnrc/cnrg/cnmapfr.htm.—By Rosalie Marion Bliss, Agricultural Research Service Information Staff. Henry C. Lukaski, Forrest H. Nielsen, and Leslie M. Klevay are with the USDA-ARS Grand Forks Human Nutrition Research Center, 2420 2nd Ave., Grand Forks, ND 58202; phone (701) 795-8429 [Lukaski], (701) 795-8455 [Nielsen], fax (701) 795-8230. "Lack Energy? Maybe It's Your Magnesium Level" was published in the May 2004 issue of Agricultural Research magazine.